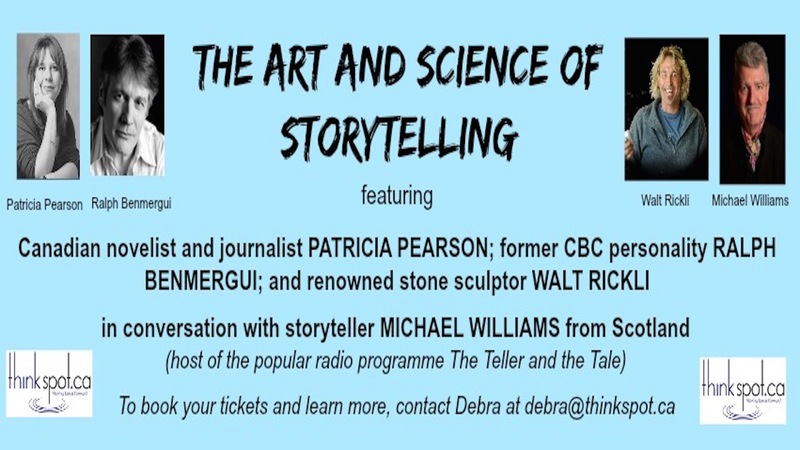 THiNKSPOT.CA is proud and excited about its upcoming special event, "The Art and Science of Storytelling". 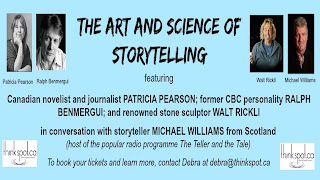 Storyteller and storycoach Michael Williams from Scotland will be in conversation with three unique and innovative artists -- Patricia Pearson, Ralph Benmergui, and Walt Rickli -- with the aim of drawing out the narrative patterns from their life and work and exploring the relevance of these stories to our lives and the stories we tell ourselves and each other. PATRICIA PEARSON - Patricia Pearson is a critically-acclaimed independent journalist whose work has appeared inThe New York Times, the New Yorker, the Daily Beast, the Daily Telegraph, the Globe and Mail, and otherwise hither and yon. . . . She recently oversaw the research for a History Channel documentary on “The Science of the Soul,” and went on to publish a book about what people experience when they die, Opening Heaven’s Door (2014), which became a finalist for the B.C. National Book Award. The documentary version of her earlier book, A Brief History of Anxiety…Yours and Mine aired on the CBC in 2012, and won a Rocky Award from the Banff Global Television Festival. She has also won three National Magazine Awards, and the Arthur Ellis Award for best non-fiction book of 1998. Patricia and Michael will talk about storytelling and death and dying. RALPH BENMERGUI - Ralph has spent his professional life in the public eye — as a performer, as well as an award-winning current affairs journalist and documentary-maker, most notably with the CBC. About seven years ago, Ralph left the media to enter politics as a strategic communications adviser to the Green Party and later as an adviser to the Canadian Liberal Party. He's also been a key adviser in the field of education, particularly with Sheridan College. More recently, Ralph has been exploring the world of spirituality, and his latest project "The New Sabbath Project" provides inspiration and practical advice on how to grow community and make your life more meaningful. Check out www.newsabbathproject.com. WALT RICKLI - While working with his family’s landscaping business Walt Rickli became intrigued with the potential of natural stone. Curious of the possibilities he began by experimenting with the creation of small stone Basins. At the Guild Institute for Stone Masonry in Whitby, Ontario, Walt started his training, and quickly recognized that he had a natural ability. Walt then discovered the Celestial Studio in Barre Vermont where he was mentored by three of North America’s greatest stone sculptors. Fuelled by enthusiasm and knowledge he left the family business after 25 years to peruse a vocation in stone sculpting. Combining his training and talent he developed a large carving studio within a quarry using old world wisdom with modern technology. 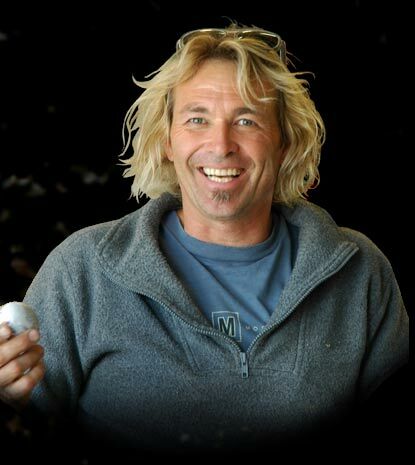 Over the years his studio has become the facilitator to thousands of wonderful stone sculptures and its design to crest sculptures from 200 pounds to 100,000 pounds has provided him with the ability to work in a limitless environment. Walt also created a public sculpture garden in his home town that showcases his work for people to enjoy year round. The Sculpture Garden is visited by hundreds of people each month and is a popular venue for events, tours, aspiring artists and individuals alike. 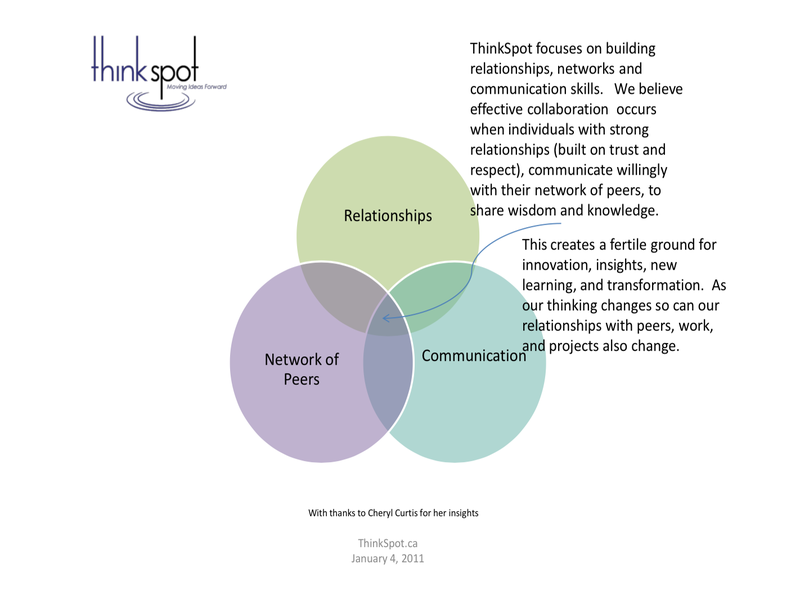 THiNKSPOT.CA - Too often, knowledge can be perceived as power and easily withheld from others. 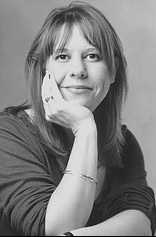 THiNKSPOT.CA was founded by Debra Pickfield. 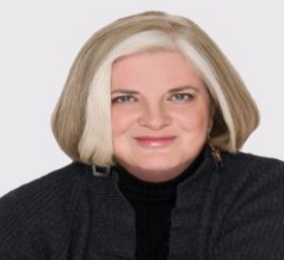 Her commitment to the study of collaboration evolved from her experience in organizations where the need was great to share knowledge, but the motivation to do so was lacking. Debra discovered the possibilities that develop when people are given the right environment to engage with each other – Things start to happen! 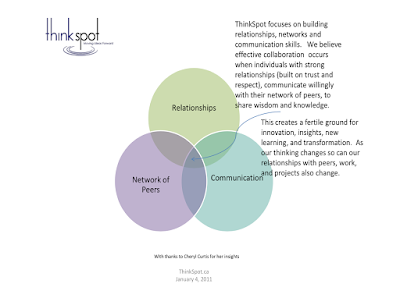 ThinkSpot provides the key elements for individuals and groups to build relationships which stimulate the sharing of knowledge, insights and collaborative thought to have amazing ideas and solutions unfold! The efficiencies of this process make ThinkSpot the preferred choice for productive meetings.